Joint problems in dogs have become very common in the U.S. Joint problems are the result of either degenerative or developmental problems. 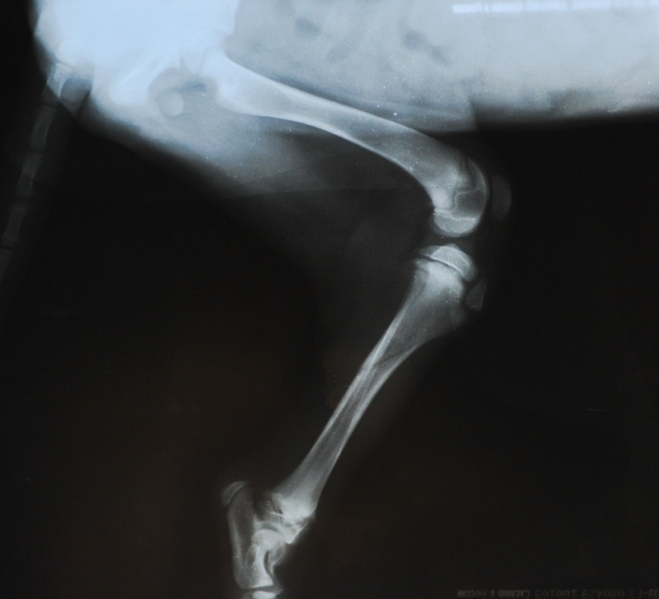 Developmental causes of joint issues begin early in a dog’s life when the joint does not correctly form. The most common developmental issue is hip dysplasia, where the ball joint in the dog’s hip does not correctly fit into its socket. As the dog ages and grows heavier, this condition will result in a dramatic increase in pain. Developmental causes of joint issues are the result of bad genes, caused by breeding and occurs almost universally in the largest pure-bred dogs such as the German Shepherds, Sheepdogs, Danes and other large breeds. Degenerative causes of joint problems include ligament injuries and osteoarthritis from wear and tear during a lifetime of running and jumping. It has been estimated that over 25% of middle-aged dogs and over 90% of elderly dogs have arthritis. Damaged genetic make-up of dogs resulting in hip dysplasia from over-breeding the largest breeds is close to 100%. Unfortunately early diagnosis of joint problems in dogs is very difficult to do. Dogs are “pack animals” by nature and their instinct to hide pain and weakness from the rest of their pack governs their basic behavior. Therefore, while these animals may be suffering long-term with joint pain, it is only when the pain has gotten very severe that they will drop their guard and show that they are in pain. At that point, they will be having difficulty in standing up, climbing stairs or getting on or off a couch or out of a car. When the pain has progressed to severe, that is the point when they may make a noticeable grunting sound or whine when trying to stand up. Just as in humans, there is no drug or treatment that can stop the progression of arthritis in dogs. Surgical procedures such as joint replacements can give relief, but this is rarely a realistic choice for 99% of dog owners. More typical treatments include: weight loss to remove some of the stress off of the joints; better dog foods containing lower fat and carbohydrates levels (less cereal filler); exercise to build up more muscle in the joint to compensate for the weaker or damaged joint; and drugs. Dogs with severe pain may be treated with pain relievers, anti-inflammatories, and analgesic medications. Alternatively, the use of supplements such as chondroiten/glucosamine, shark cartilage (which is made of chondroiten sulfate), and fish oil have become increasingly popular in dealing with dog joint issues. They are relatively inexpensive, non-invasive, do not require a prescription, are an excellent source of nutrition, and have no negative side-effects. If you wish to reduce your probability of having a dog that will develop future joint problems, buy a mutt. Genetic diversity helps reduce the incidence of joint issues later in life. Stay away from the largest breeds. If a purebred dog is necessary, purchase from a reputable breeder, ask to see the dog’s lineage for any history of joint problems in its family and if possible have the dog’s hips x-rayed and examined by your Vet to search for signs of deformed joint development — prior to puchasing the dog. Once you have adopted your dog, consider that keeping it lean, in good physical condition with plenty of exercise, and fed with good food will help long-term to reduce or at least delay the onset of joint problems. © 2019 Seagate World|ProPhoto Photography Blogsite by NetRivet, Inc.